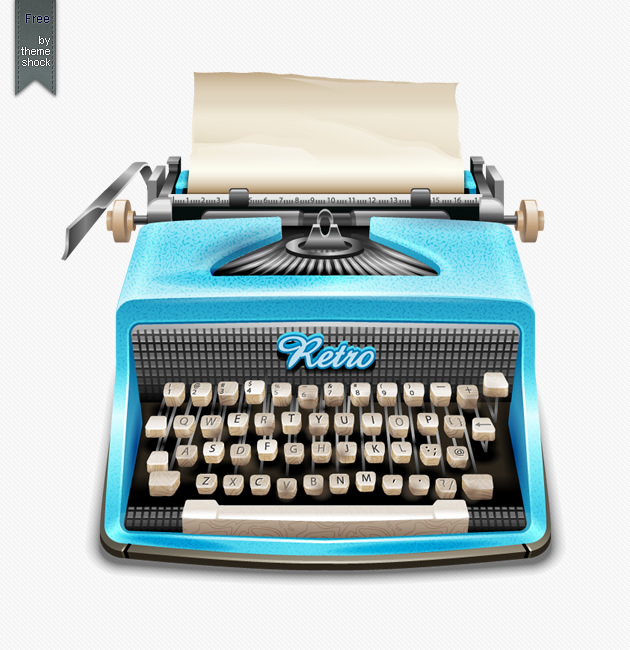 When my blog friend Duni picked a typewriter for her moodboard, I was suddenly reminded of my good old high school days. I grew up in the era when everything is on transition to automation. I have witnessed how some manual processes are gradually replaced by the electronic systems. The nearest technological change I felt was the fast proliferation of desktop computers in the academe. Back in my High School days, every English subject I have taken required us to write, write and write. 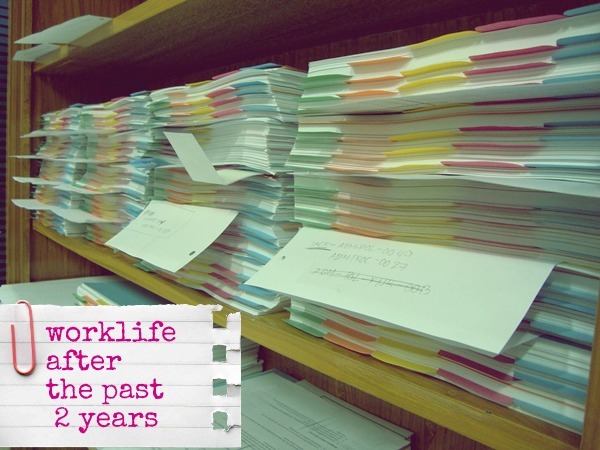 From formal themes, book reports and reaction papers, we were always given a topic to write. Unfortunately, not all topics were enticing to write. Reading the Iliad, Odyssey and all those classical novels were not just my turf. In effect, imagine the problem I have to endure to generate that one decent book review. When all the ideas in writing book reports are present, what’s next? The need to finally place them in writing or better yet, type! Type! Type! Most of my classmates then were blessed with their own set of desktop computer and printer. Hence, preparing book reports is easier for them. As long as the ideas are present, Microsoft Word takes care of everything. In my case, I have to settle with the classic typewriter, which my humble and hardworking parents could afford. The typewriter gave me my own set of bitter sweet memories. To some extent, I would like to believe that the typewriter made me a better student and (if I could claim) an aspiring writer in my own world. The 15 minutes spent in encoding a page will double if the typewriter is used. In my case, I have to spend hours of writing and rewriting from scratch and endure more hours of painfully stroking the hard keys of my typewriter. While my fingers become exhausted, I still have to ensure that each word is correctly spelled as I stroke each hard key. Otherwise, I have to repeat the entire page. It’s either I make or break a page. Though there is always the correction tape to save the day, I was never satisfied with a dirty paperwork. These inconveniences were never encountered by my classmates, who were blessed with desktop computers in the comfort of their own home. Hitting the backspace key and the undo function will immediately correct everything. Thesaurus function? With the typewriter, I have to manually check my heavy and hardbound dictionary to search for alternative words. Microsoft Word brings however the convenience of finding better words in seconds by just hitting shift + F7. How could I ever forget the grammar police function? The typewriter’s function is literally limited to encoding. It will never remind you of the rules in subject and verb agreement. If you own a typewriter, you better learn to self-edit. Otherwise, your paperwork will become literally and figuratively messy with the residue of the ribbon’s ink. How about headers and footers? Good thing that my previous teacher trained us to use the Parenthetical Notation. I don’t need to burden myself because of the need to adjust the typewriter’s knobs and position the paper on that perfect spot. How do you achieve a perfectly justified and centered text? Never can you do this in a manual typewriter. Otherwise, you have to engage in some trial and error attempts in spacing and alignment. The typewriter doubled the efforts I have to endure in those times when I have to write my own paper. Of those difficult times, I cannot however recall any instance of ranting and complaining. I've never seen the situation as difficult in the first place. I learned to settle and made the most of what I have. I never saw the typewriter as a hindrance to my studies. In my senior year in High School, our English teacher required us to submit a two-page critique paper. To my biggest surprise, I was the only kid who submitted a manually typewritten work. Another surprise came in because I never received any insult or belittlement from any of my classmates. In fact, my seatmate, whose name is Bernadette, even acknowledged my work. The exact words she told me was “Wow typewritten! Ang hirap nyan ha!” (Wow, you produced a manually typewritten work. That must have been very difficult to prepare.) After receiving that comment, I never felt ashamed of my manually typewritten report. Anyway, our teacher doesn’t grade us by the device we used for our paper. Obviously, we all know that at the end of the day, substance always prevail against appearance. The past week has been so good to me. My week started with an unusual fast moving Monday traffic. Lesser traffic means hassle and stress free travel time. Hopefully, this will continue for the rest of the week. 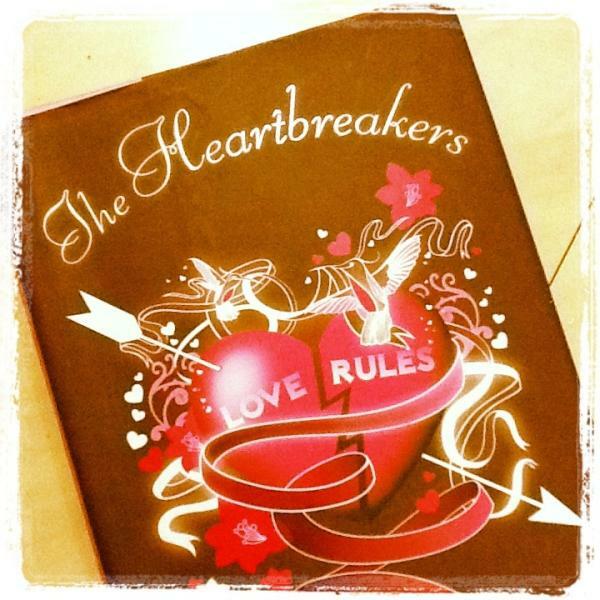 The book deals with relationships but diverts from the typical love stories of chick lits. I'm enjoying the story and blog my review soon. I by the way purchased my copy from my favorite bargain bookstore, Book Sale. 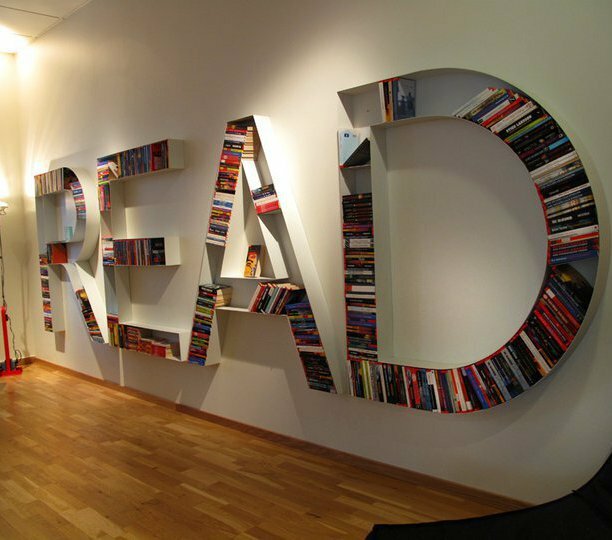 A proof that happy reading doesn't need to be expensive. My feet and lousy iPad camera don't do justice with this beautiful pair. 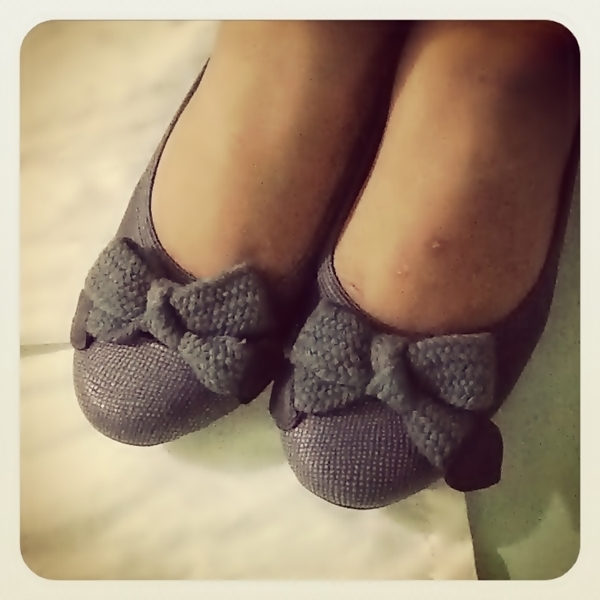 It comes in my favorite blue but I realized that my feet doesn't complement the darker shade. I scored this ballerina flats 10 percent off its original price. There were more beautiful and expensive pairs in the mall but I managed to strictly comply with my budget. I was not tempted to purchase another expensive pair with my evil plastic rectangular device. Clap! Clap! 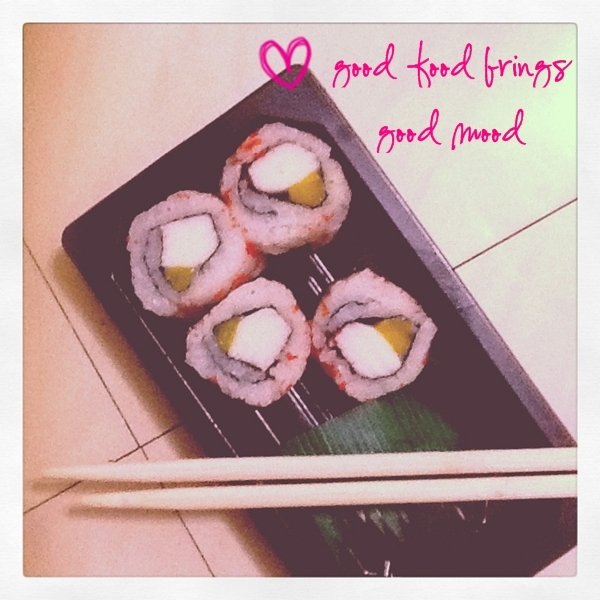 Who doesn't love good food? This California Maki from Tokyo Tokyo is my current favorite. After a tiring day from work, I drop by the nearest Tokyo Tokyo branch in our area. I savored my most awaited Japanese takeout before I finally doze off. If I didn't allow myself to regain my interest in blogging, I would not have the opportunity to own these blessings. The past week will be memorable because I started my dream of building a career in online writing. My greatest dream is to become successful in this field for many reasons. It is in writing where my heart turly belongs. Writing is my first love. I would be the happiest if I have the career the makes my heart happy. Another reason why I wanted this career apart from my day job is the need to save up for my future. I wanted to assure myself that I'll be financially ready as I age. Lastly, I have the dream of sharing this opportunity to my students and fellow blog friends. However, as the Full Cup Theory says, you cannot share what you don't have in the first place. I wanted to become a living testament before I share this promising opportunity. Try typing your blog address and replace ".com" with ".hk"
Did the link connect to your blog? Mine proceeded to my actual blog page. However, I can't understand was how the word "hk" became attached to my blog. Can anyone explain this? I tried typing the url of some of my blog friends and the same thing transpired. Blogs who are still using the blogspot domain are affected by this. Should I get my own domain name to address this issue? I'm honestly frightened and worried. The blessings and happiness are overflowing! The package came all the way from South Africa, a country which I hope to visit when I'm already a millionaire. Haha For those who have been reading my blog, you might have encountered my Christmas in July post. I participated in a party that enabled bloggers to meet and send gifts to a fellow blogger. Natasha and I were paired to exchange gifts. Natasha's present arrived while mine is still en route to South Africa. Hopefully, it doesn't get lost in transit. Natasha's gift was handmade which I really appreciate. This is something I wanted to purchase for the longest time. Natasha mentioned in her email that she only referred to size and dimensions provided by the Internet. She was worried that my most cherished gadget will not fit. Well, look at this now Natasha. Worry no more, it's a match made in heaven. Pouches for electronic gadgets should provide adequate support and protection. This is something I really consider in looking for a case. The case should be thick enough to protect the iPad. However one of the trade offs rendered by this security feature is the fact that the pouch becomes thicker and heavier. Such problem was addressed by the magical touch of Natasha. The pouch has the enough cushion attached as quilts to make it more feminine. :D You did a great job my friend. Aside from my most awaited pouch, Natasha also gifted me with postcards from her dear country. Though the internet provides us the easiest means to search and download pictures of other countries, I still appreciate receiving the classic postcards. I could not ask for more! The necklace is so me. It came in my favorite color blue. All the gifts were perfect. The happiness is just overflowing. And for my dear readers, please share your love to Natasha. Please visit her blog and Etsy shop. Anyway, in attempt to find beauty amidst my shallow complaints, here are some things that kept me happy over the past days. Double Bs! Books to read and Bills to pay... It's my first time to teach Macroeconomics. It's not that I'm having a hard time with the subject. The feeling is closer to disappointment about my past lectures. I just feel that I was not able to give my best in class this week. (Sorry kids) However, this pushes me to strive more. I used to teach Business Plan Writing and Research. But since there has been a shortage of professors for this subject, my direct supervisor in teaching gave me this assignment. Despite of everything, I still love my part time teaching stint and I'm looking forward on what I could share more to my restless college kids. Bills to pay... Whoever loves this bitter part of life? I always believe that I will remain to be very kid at heart. But life will always make a way to make me realize that I should rather be a responsible grown up. The bills to pay is one living testament to this reminder. Hopefully, everything will turn out well. As soon as I finish my freelance works, I can breathe and see life as a kid again. Books! Books! Books! When I purchased my iPad a year ago, it was intended for my first ever international endeavor. After that event, I used it as a substitute for my netbook. It served me well during my classes since it's lighter and more convenient to carry. I never realized the potential of my iPad to become my newest library. My former students have been sending me sources and links of where to download the best e-books. Though I still love the feel and smell of a printed paperback, the iPad has been giving me an elevated reading experience. If I purchased all of these books, I would surely be swiping my deadly plastic card again. E-books contribute in my objective of developing worthwhile and financially friendly hobbies. More importantly, I'm not burdened of looking for a decent space to house my growing book collections. Despite of everything, I believe that life will be better and happier on the next week. After almost a week, I’m finally updating. In case you haven't noticed, my previous post still related my Beautiful Sunday series. I almost thought that it would take me another Sunday to upload another post. Being busy is a lame excuse. I know. But the truth is, I became so lousy and lazy this week. I wasn’t able to properly handle my time. Hence, this blog became one of my careless casualties. Today is my favorite day of the week. It’s a payday Friday and instead of going to the mall, I decided to stay home. Hooray! It was raining the entire day and I felt that it would also be best if I head home to prevent getting stuck in traffic and misery. 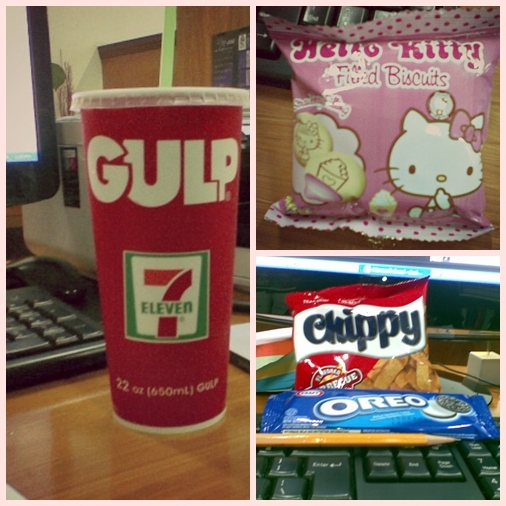 I have other finances to prioritize so my shopaholic hormones thankfully subsided. I chose finishing my current read in bed, while enjoying the rare cold temperature in the city. I was about to start my next read when I felt the need to check my blog. I noticed from my reading list that Ricki is hosting the Literary Friday.I felt motivated to get out of my comfy bed and here I am writing my first review for Emily Giffin. Love the One You’re With related the story of Ellen and her“perfect” life. She has a promising career in her field of interest, financially stable and loving husband, and very caring in-laws. Ellen is blessed with the life every woman would pray for. But as they say, life and happiness meant more than what we perceived as perfect. It used to be Leo and Ellen. Ellen was so in loved with Leo that she could almost see the future ahead of them. Unfortunately, Leo never shared Ellen’s dreams. As mentioned in the book, Leo doesn’t believe in forever. Ellen felt devastated and this served as one of the triggers of their break-up. Ellen invested more in their relationship which in effect left her more devastated and pathetic. In the course of Ellen’s recovery, she met her husband Andy. Andy proves to be the perfect partner for Ellen. He was the brother of her best friend, Margot. Life seemed to be perfect for Ellen not until Leo returns. Leo offered a job opportunity which Ellen cannot refuse. As much as Ellen wanted to remain faithful with Andy, she wanted the opportunity for her career. This is where the succeeding events and conflicts in the novel unfolded. Ellen later fell in the trap of finding answers to issues that remained unsettled with Leo. In addition to this, Ellen found herself in the brink of threatening to lose her marriage. 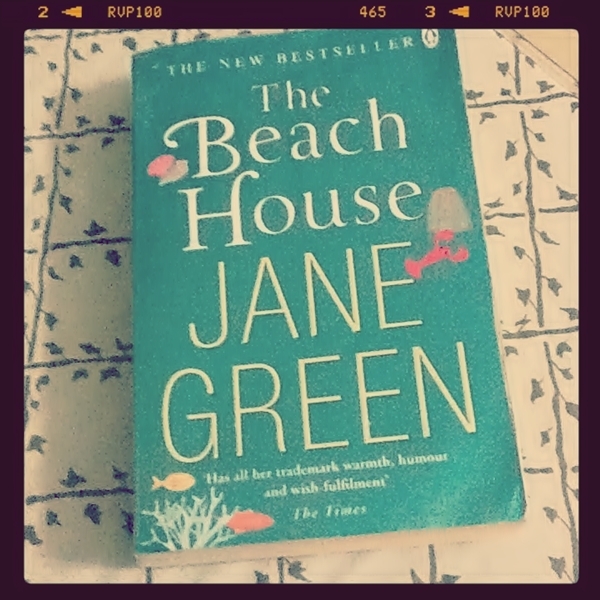 The book maybe classified as a shallow chick lit which as most people would claim, circulated to a woman's quest for that one great love or mending a broken heart. Such however is not the case for this book.Giffin provided real life depictions of hidden conflicts and issues of a married life. One of which is how the wife/husband handles relationships with in-laws. No matter how much you love and respect your in-laws, there would always be conflicts that will arise. In the Philippine setting, this is equivalent to saying that when you choose to marry,you should also open your mind and heart to the idea that you are also marrying your other half’s family. Sometimes there are no happy endings. No matter what, I'll be losing something, someone. Love is the sum of our choices, the strength or our commitments, the ties that bind us together. My main project for the past two years will finally be completed. I'm just waiting for the final word of my Big Boss. Once my Big Boss renders his sweetest yes, these documents will find their way to each office at the workplace. One of my colleagues even told me that whether I admit or not, I love these papers and they make me happy. Yes my dear friend T, you captured what my heart is silently saying. I found the best solution for my headaches and heartaches? 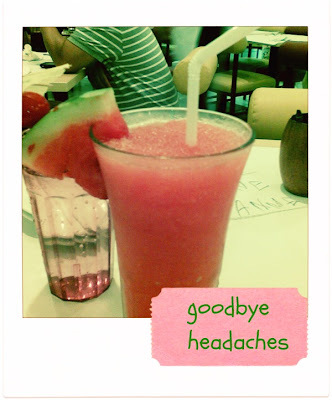 I'm becoming addicted to Watermelon Shake ever since I went to Boracay. I've been craving for this every Friday night. While everyone is going crazy over Magnum, I'm contented with the local Vanilla Pinipig crunch. This one is from Selecta, but I also love Magnolia's pioneer version. For the benefit of my non-Filipino blog friends, this Popsicle is your typical chocolate coated ice cream. However, instead of the traditional nuts, this famous Filipino Popsicle is covered with Pinipig or rice krispies. It was payday Friday and I've been tempted to purchase a new pair of shoes. However, my prevent-my-shopaholic hormones prevailed. I've been to the mall a couple of times this week and I found myself not buying anything. Hooray! Instead of shopping, I had dinner with one of my reliable girlfriends. Anne and I are hooked to the famous BonChon Chicken. The famous double fried chicken is our newest crush. :D My past meet ups with Anne always meant having lunch or dinner in their small and always crowded branch at SM Megamall.We don't really mind standing and waiting for our turn. The best food for us always deserves all the waiting and patience in the world. It was my Father's birthday so I gave him a surprise present... Hopefully, he appreciated it because everything I give him is pure product of my honest hard work. I may not be able to give my Father the best of what he deserves...and this frustrates me a lot. But one thing I can always promise him is to remain honest, humble and silently treasure the simple yet honorable life he gave me. How about you? What are the simple things that made you happy over the past week? While my life has been getting its own share of trials and challenges, I decided to divert my attention to some things that made me happy. Problems will always keep us occupied and burdened. If such is the case, then why not leave the heavy load for a while? Take a rest and retrieve them when we are ready and less occupied to accommodate them. If only life provides a concierge or a package counter that can look after our problems, I will be one of those who will patiently fall in line to temporarily leave things behind. Last Saturday, I finally had the courage to revive my old weekend ritual, JOGGING! 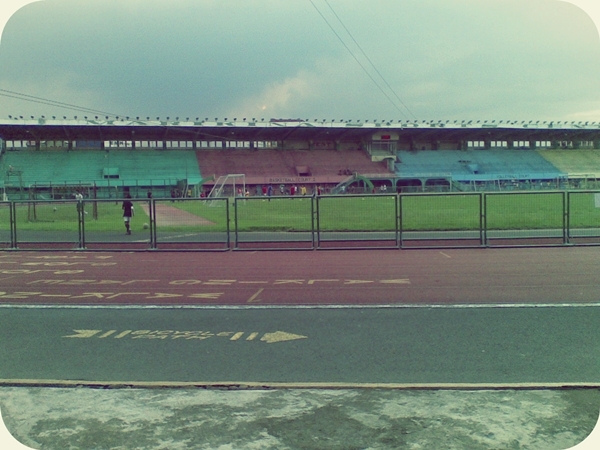 After my weekend date with my Nanay (mom), we passed by the Town's Sports Center and I suddenly felt the longing to run again. We reached home early and to everyone's surprise, I changed to my jogging pants and running shoes. Actually, even myself was surprised of the impulsive decision. Why the rush? There is still Sunday and the clouds don't seem to favor an afternoon jogging. To be honest, I also don't know. Perhaps, my pituitary glands responsible for all the adrenaline rush of my system can explain. The clouds made everyone felt that it will soon rain. However, the heavens connived with me. It only started raining when I reached home. 2. My next trip is booked! I'll be adding another country to my list next year. Hooray! The place I will be visiting is one of my dream destinations. I'll be flying with an economy airline that has been responsible for all my trips abroad. Yes this airline has its own share of inefficiencies lately. But I'm keeping my fingers crossed.... they will not fail me. I'm also praying that there will be no hindrances in my life that can prevent this trip. I mentioned in my previous post that one of my blogging goals is to review a book at least once a month. I may not be able to comply with my target, but I'm more than happy of the little time when I can squeeze in reading. Despite of being dead tired after a day of teaching, I found myself enjoying a great read on my 30-minute train ride. I'm using less of my iPod because of my desire to rather concentrate on reading. 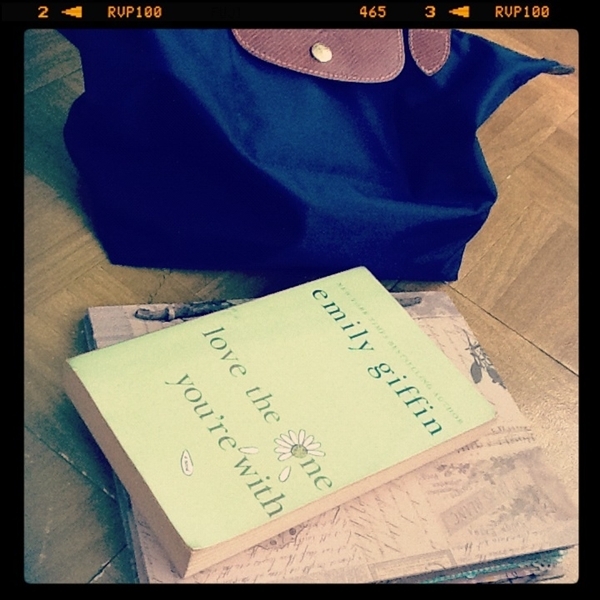 I'm reading Love the One You're With of Emily Giffin. A confession to make, I purchased this book 2 years agooooo.... I'm so glad that I finally had the initiative to read it. The brown notebook beneath my read is my summer journal. (Hi Ricki!) I'm proud to say that I will soon be done with my attempt to revive my interest in arts and crafts. Say hello to my babies :D Yes they are mere stacks of papers. But for me, they would remain as my precious offspring, I mean output. I've been carrying them in my heart and mind for the past 2 years. When I was transferred to my current office, this was the major project that my Big Boss has given to me. He started this project but since there are other tasks coming to the office, he gave me full control and responsibility. When these documents will finally be in hardbound and distributed to the different offices, I can finally breath and say mission accomplished. I have been talking about my work in this blog for almost forever. Most of the work I mentioned here evolved on my part time teaching stints and the occasional freelance writing jobs I receive. Only my few blog friends know that above and before anything else, I'm your typical rank and file employee. 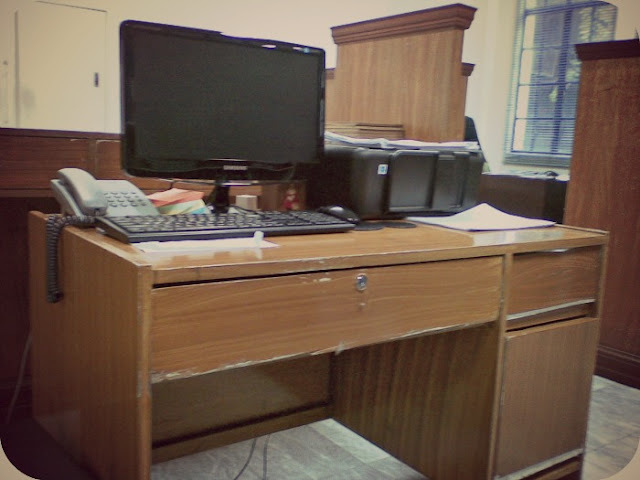 When I was first transferred to my second home, me and my boss stayed in this teeny tiny space. How tiny? He could almost see and read the sites and programs I open from my computer. Hence, I was so productive during those years. 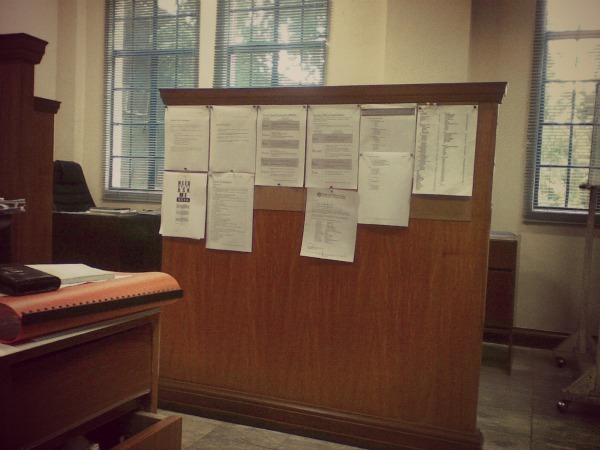 Haha When I need to talk to him, I just swivel my chair to my right and there, we have an instant departmental meeting. After a year, we were fortunately relocated to a bigger place. Another irony in my worklife, our new space used to be occupied by the first department where I came from. Since I work in an institution that has been living for almost 400 years, the interiors of our place resembles the old and traditional ways. The Administration Building where we are housed is recognized as one of the oldest structures in the entire Manila. The office where I stay everyday was existing since 1620. The facade of our building only undergoes maintenance and restoration. By management directive, renovations at the workplace are only allowed within the premises of the offices. I once made a post of my dream workstation makeover. I really wanted a place that carries the contemporary and ergonomic design. But then, budget constraints and like a typical department, we have to prove enough to the management that we needed a major renovation. Our office counter is occupied by this plant whose name I don't even bothered to know. My boss has fetish for keeping indoor plants, which sometimes causes me some panic attacks. I have nothing against plants, let me clarify that. I just feel worried of the insects that the stagnant water can accommodate. After a friend / colleague died from Dengue, I freaked out whenever I get any form of insect bite. By the way, this reminds me that I now occupy the space that my deceased colleague left. Though we have a lot of antique treasures at the work place, the management fortunately doesn't allow us to use vintage computers. 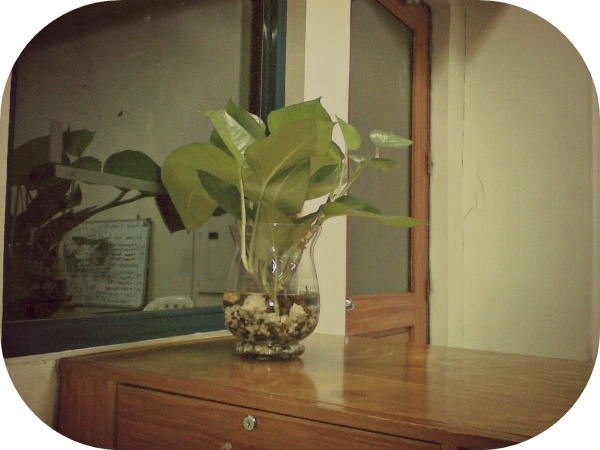 :D If we can't be blessed with renovation, my only wish for my table to be replaced. As you can see, the wooden edges of my drawers are nearing to dilapidation. Yes I know, we shouldn't be eating from my table. But when life gets too much busy, I don't have a choice but to bring them in my space. They form those little things that keep my bulging belly happy. An improvised bulletin board and papers posted by the boss! For some they call it the pressure reminder board. Fortunately, my boss is not that type.Speaking of my boss, the space you can from the left serves as his own niche. He may not see what I'm up to my computer (to my relief haha) but he can always observe my expressions and movements from his place. On the next days, I'll blog about my soon-to-be major accomplishment and some things that keep me happy over the past days. which I posted on Instagram, prompted her to share the unique bed. She later gave me an idea of what to post for my 11th Beautiful Sunday. The books you see only represent a segment of my humbled and treasured book collection. My other books at home are found on my old working table, in the hidden compartment of my bed, the spare drawers in my cabinet and to spaces everywhere at home. My disorganized collection often irritates and causes some minor arguments with my Nanay (mom) :D Facing a dilemma of where to house my growing book collections, I found myself googling for unique shelves. 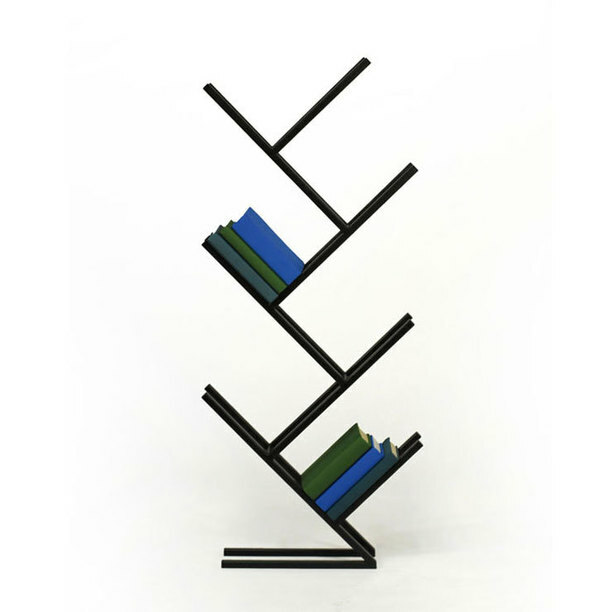 Though budget dictates that this is not the right time to purchase a new shelf, my imagination fortunately doesn't restrict me to wish for any of these unique shelves. Not really made of wood but metals shaped to a branch of a tree. I like the fact that the design combined simplicity and creativity. I seriously want something like this! The space under the staircase remains as one of the most idle points in any home. 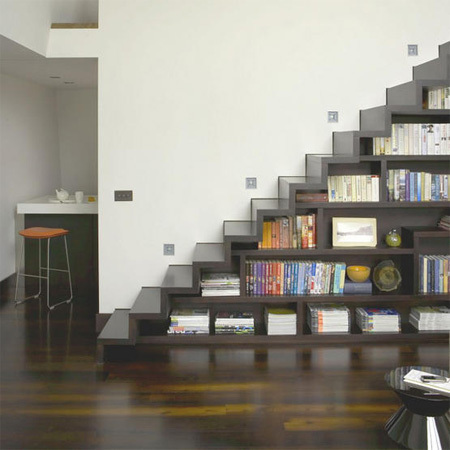 Converting the space to a book shelf is one of the many ways we could maximize this often underutilized space. Wood and wine bottles? Why not? They make a great book shelf too. In like manner that a table, a book and a glass of wine creates a relaxing environment for some. 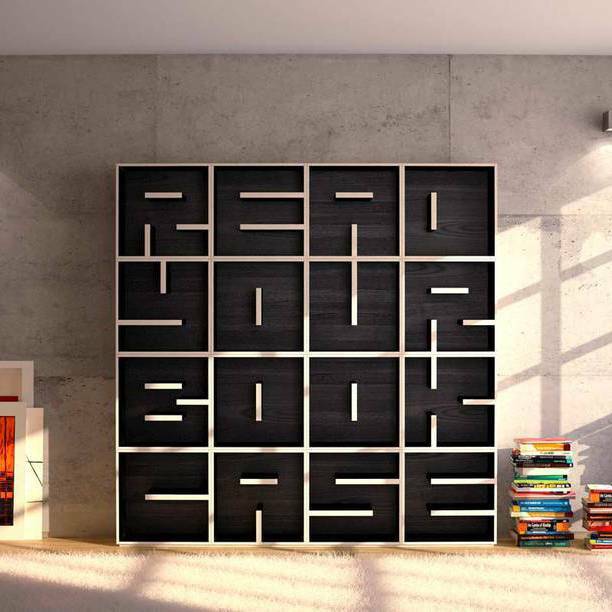 A circular and revolving book shelf, I like! 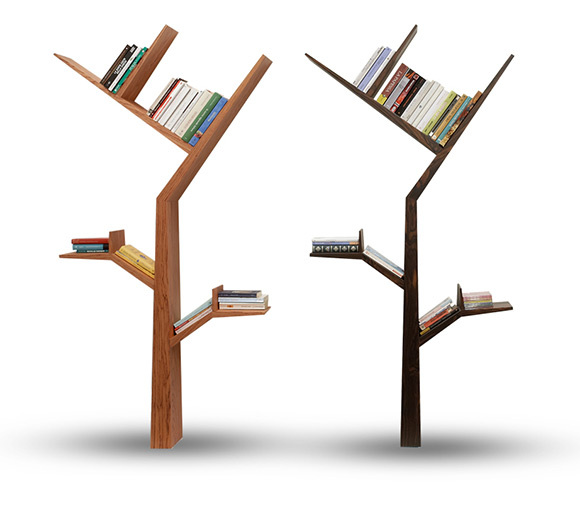 The tall circular shelf is very space saving and can work for lazy readers like me. with hidden compartments to accommodate a great number of collections. How would you like to have this? My own library equipped with unlimited number of books, wooden shelves, wooden floor, comfy couch and a window that provides a great view from the outside.